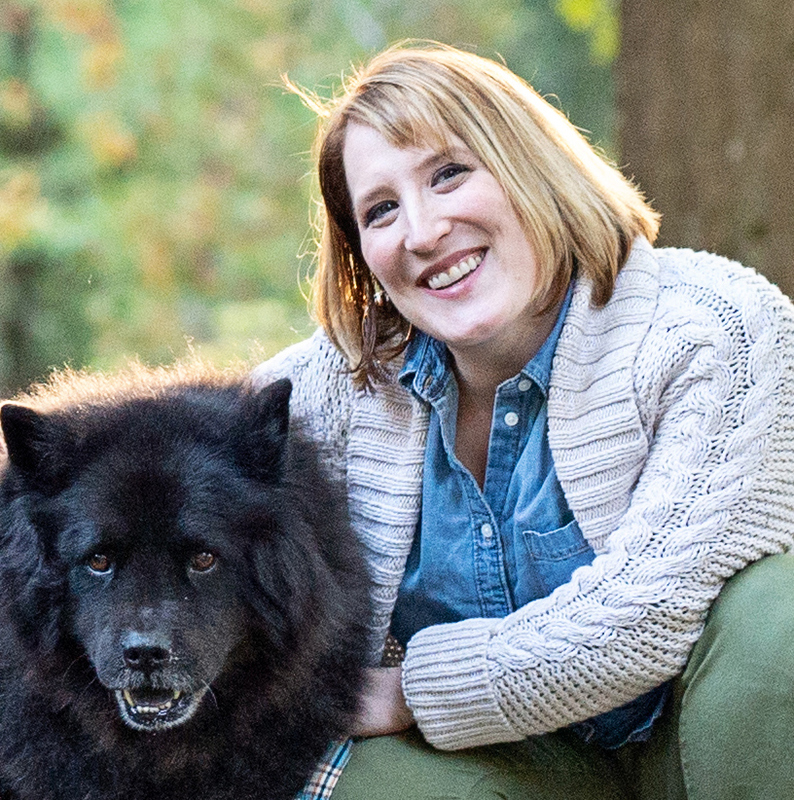 Sorry for being MIA – between all of the holidays, work and some health stuff, that’s just the way it goes sometimes. I had high hopes for finally getting a good pic of our sukkah, made from our chuppah frame. Alas, that didn’t quite happen. But, I’m back with a little something I made for a dear friend who is in the midst of wedding planning. There are just times in a girl’s life when no ordinary thank you note will do and goodness knows that in the months leading up to a wedding, there is no shortage of thank yous to write! 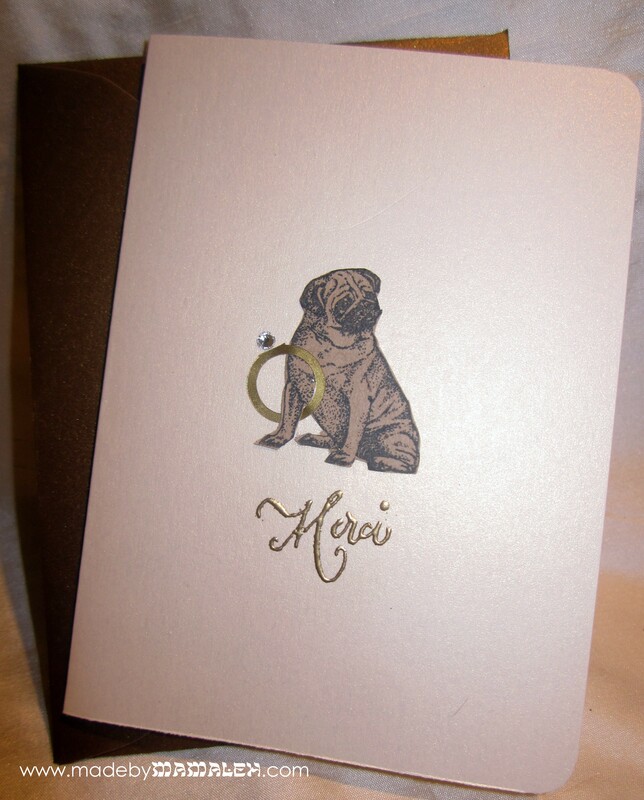 This particular friend is a bit pug obsessed and I have made her other pug cards in the past but this one had to be extra special and elegant yet fun. So, using my favorite cardstock, Curious Metallics White Gold (we used this for part of our wedding invitations maybe that’s why I love it so much! ), I created 4 bar size cards and rounded the corners with my Corner Chomper. 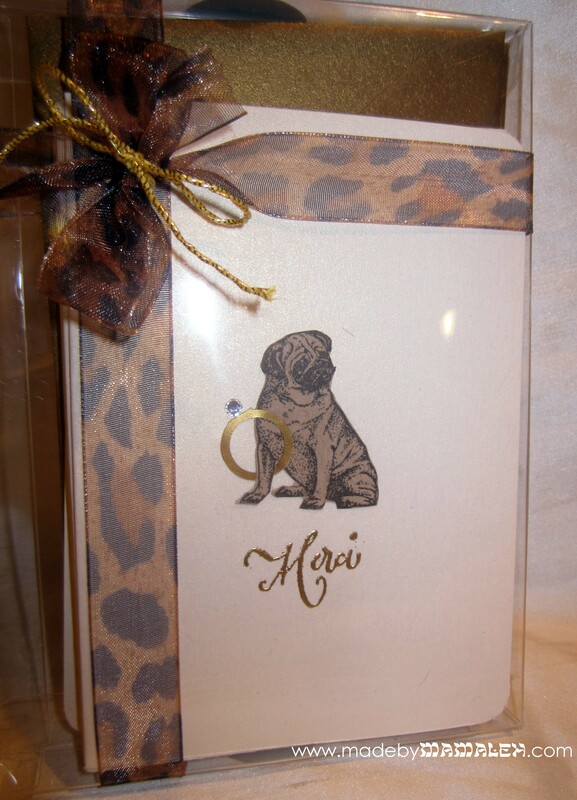 Then I stamped my pug rubber stamp (sorry, I do not know the brand – I got it several years ago at my local Impress) on Speckletone Oatmeal with Versafine Onyx ink and then very carefully cut it out with detail scissors. The next part was the trickiest – figuring out just the right size for the ring – which I cut out using my Cameo from Silhouette printable (&adhesive) gold foil. Once I had the size just right, I positioned it on the pug (carefully lifting up just the leg to intertwine them) and then added the BLING! 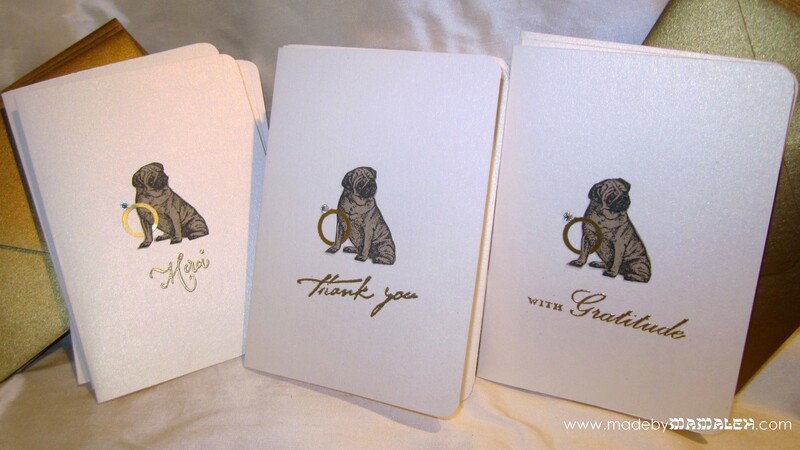 Finally I stamped several different thank you sentiments: Merci, thank you and With Gratitude (from a Brenda Walton set) and embossed in gold. Viola! I paired the cards with metallic bronze envelopes and packaged them up in a little box with some ribbon – a perfect pug-lovers gift for a fun random act of kindness to get back in touch with this year’s earlier resolution! I am also entering it into Moxie Fab World’s All That Glitters is Gold Challenge. Hoping to get back to more crafting as things calm down a bit around here! Hope all of your holidays were sweet! This entry was posted in Challenge, Handmade Card, Random Acts, Rubber Stamps, Wedding and tagged handmade card, Moxie Fab World Challenge, thank you notes. Bookmark the permalink. My two favorite things together…gold and pug dogs!